Grevillea x semperflorens is a hybrid whose parents are said to be G. thelemanniana and a yellow-flowered form of G. juniperina. The hybrid was found in a Plymouth (UK) garden in the late 1920’s. Grevillea x semperflorens is an upright shrub that, in our garden, reaches a height of two metres. The narrow leaves may be linear or divided into segments crowned with a sharp point. Orange-red flowers are held in pendulous racemes. Our plants are rarely without flowers. In fact the hybrid name means always flowering. Our plants have proved to be hardy, very free flowering; frost resistant and once established have very low water requirements. An occasional light pruning is appreciated. Propagation must be from cuttings to preserve the hybrid’s characteristics. We find that cuttings strike enthusiastically. The type specimen was collected from a plant growing in the Royal Horticultural Society (RHS) Gardens, Wisley in Surrey, England in 1937. The Western Australian Herbarium has a specimen collected from the type plant also in 1937. Grevillea x semperflorens was still growing in the Wisley Gardens in 1997 when a specimen was collected for the RHS herbarium. The Mole Station Native Nursery, near Tenterfield NSW, is propagating this hybrid. Our original plant came from this source. 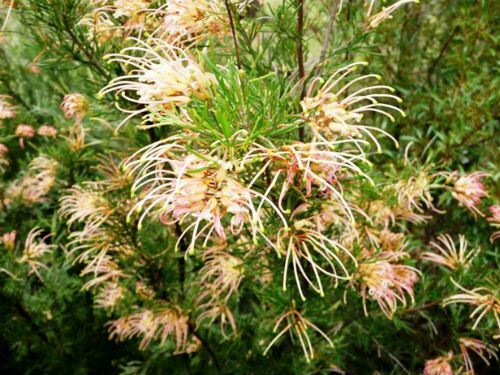 Grevillea x semperflorens was probably one of the first named grevillea hybrids.